On a small farm at the cusp of the Norwegian seaside, in a rustic wood-paneled studio strong with the smell of linseed oil and time-tested pigments, a pack of painters cluster around the Master, passing a bottle of wine and poring through stacks of aged books. The volumes of images, pages smudged with paint stains and spines cracked from years of devoted study, are laid out for comparison, ranking, and impassioned debate: which paintings are the greatest masterpieces? The blue light of the midnight sun filters through northerly windows and a ram in the field outside contributes his voice. The scene is not unlike one you’d imagine taking place in the atelier of Rembrandt, or indeed in the studio of the ancient Greek master Apelles, who for centuries after his death would be held as the gold standard for great painters. But what was it about this painter, little known today, that explains his lasting influence on what we now know as the Renaissance and Baroque? And why does this group of four contemporary painters from different parts of the world trace their lineage back to his principles? Little visual evidence remains today of the work of Apelles, though detailed descriptions of his skill are documented in the 35th book of the Naturalis Historia penned by Pliny the Elder, historian of Rome. He was lauded for his “gracefulness” of composition and execution, celebrated for how lifelike his portrayals were, and praised for his “Dorian precision with Ionic elegance.” One story recounts a competition to paint a horse. Apelles, wanting the most unbiased opinion, requested that horses be the jury of the work. Only when they were shown his painting did the horses neigh in recognition, proclaiming Apelles the winner. Apelles was said to have openly recognized his inferiority to rival painter Protogenes in terms of accuracy. Protogenes was known for his sharp lines and realistic portrayals. But it seems that Apelles placed his value instead on an a liveliness that comes from capturing the spirit and primitive essence of human and beast — a breathing, vibrating quality that is born of patience and empathy rather than preoccupation with accuracy. Greek verses sang the praise of his “Anadyomene,” a painting of Aphrodite emerging from the sea that was dedicated in the Shrine of Caesar Augustus. But Apelles, unsatisfied, began a second version of the painting, meant to surpass the beauty of the famous original. However, as recorded by Pliny, “death grudged him the work when only partly finished, nor could anybody be found to carry on the task, in conformity with the outlines of the sketches prepared.” This principle of reproducing and copying a work to improve and pay tribute to it was not rejected as it is by the art world today. Instead there was striving to make the best reproduction of an archetypal image. Apelles did this. So did Pieter Bruegel the Elder, the Flemish Renaissance painter, Federico Zuccaro, the Italian mannerist, and Botticelli — who all produced their own versions of Apelles’ renowned work “Calumny.” Titian also paid tribute, recreating a version of “The Armor-Bearer” by Apelles that now hangs at the Getty in Los Angeles. Apelles was known to say, “I paint for eternity.” A more fitting mantra does not exist to explain Apelles’ influence, manifest in history’s great painters and in his disciples today. From the hours devoted to layering paint, creating rich and lasting texture, to supernatural subjects, the virtues held highest by these painters are not of a temporal nature, but the human qualities that transcend the modern art zeitgeist. 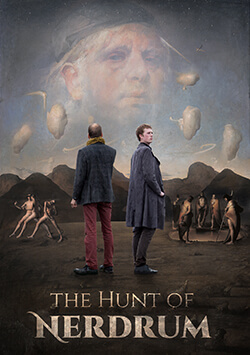 Under this rogue flag of tribute and pupillage, Nerdrum, Knodell, Molesky, and Hillestad study, imagine, and conjure new works inextricably linked to the past but also outside of time. There is a collective darkness, yearning, and sentimentality about their figurative paintings that is synergetic. It is as though they are already part of a world of ancient traditions, story, and secret arcana — one we are being invited to enter. “Pupils of Apelles,” featuring works by Luke Hillestad, Caleb Knodell, David Molesky, and Odd Nerdrum, opens November 15 at Copro Gallery in Santa Monica, California’s Bergamot Station. A reception from 8-11:30 p.m. celebrates the opening. To learn more, visit Copro Gallery online.